Nobody goes for the ‘more of the same’ theme at a festival. “This year, our output will be exactly the same as last year” – the popular wisdom is why fix something that isn’t broken. If it isn’t new, or reinvented, or remoulded, or reinvigorated, then you’re standing still – nobody wants a festival that reiterates the same mantra every year, unless it is something like “Get your free bacon here”. Nevertheless, while we’re not sure most people would notice between ravenous mouthfuls whether the Copenhagen Cooking and Food Festival organisers are daring (or not, depending on your perspective) to be different, their ‘Breaking the new’ theme promises copious amount of envelope pushing and trail blazing. 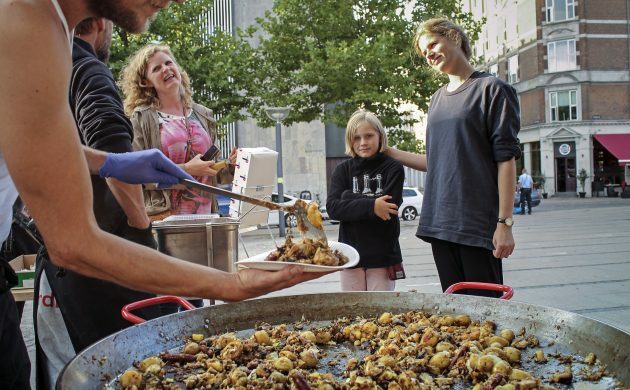 The organisers explain that this year’s theme will enable the Danish capital to take a step backwards and admire its handiwork over the course of this century, as it has “evolved from a gastronomically unknown capital to a world-class food metropolis”. Armed with an innovative mindset, courage, skilled practitioners and strong pioneers in the front line, Copenhagen has gone from strength to strength, taking its Danish gastronomy and food production to the high level it finds itself enjoying today. For many years, the festival has been the cooking point where new ideas, trends, initiatives, products, knowledge, business platforms and experiences gather to fuel the gastro-metropolis that we call home. In truth, Copenhagen never stops cooking, breaking new ground at every opportunity. Every juggernaut needs a furnace, and this year that honour befalls Israels Plads, a historic square in the city centre that like its food scene has never stopped embracing the new this century. On August 18, make sure you don’t miss the festival’s official opening party, the Ultimate Barbecue Party (details below), where four professional chefs from restaurants such as Taller and Naes will be manning the grill. The admission price includes a welcome drink, four barbecue dishes and as much Jacobsen beer as you like until 20:00, including a special one commissioned for the festival. And remember the location well, as you’ll want to return there three days later when it hosts the unofficial world hot dog competition – a charity event at which diners will be invited to make a donation to CARE Denmark’s charity work in Laos. Each competitor will make 100 gourmet hot dogs each as they seek to impress a judging panel that includes three Michelin star chefs. While the main contest starts at 17:00, the event is kicking off two hours earlier with music, beer and hot dogs for the kids – a cunning move to ensure they’re full up by the time the gourmet range hits the platter. But we had hot dogs last year, we hear you say. And a barbecue! What’s wrong with ‘more of the same’? Take note, organisers – sometimes you don’t need to reinvent the wheel if your festival’s reputation is already this well-rounded!